One of Wall Street's biggest banks is now open to Main Street. 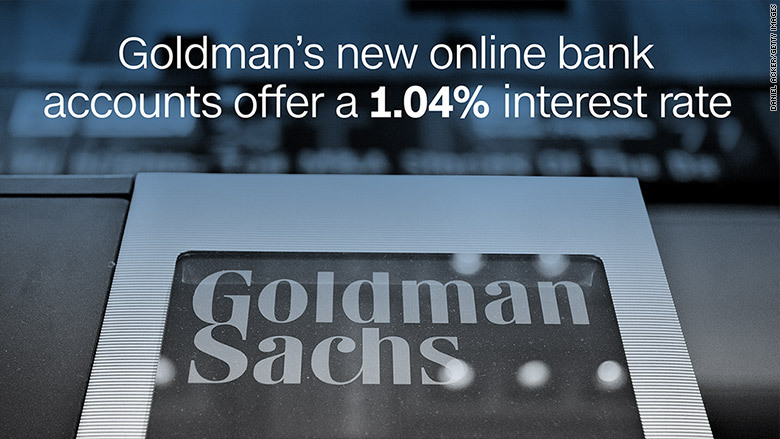 Goldman Sachs has entered the online banking game, offering bank accounts that don't require a minimum deposit to open and have a 1.04% interest rate. The accounts don't have any transaction fees, but customers are limited to six withdrawals or transfers in a monthly statement cycle. Customers can sign up at GSBank.com, which launched last week. It's been tough for savers to find a decent interest rate in the wake of the Great Recession. The Federal Reserve has kept interest rates near record lows to help boost the economy. Lower rates make it cheaper for banks to lend money, but they also put a lid on the amount of interest consumers earn on their savings. The average national rate on savings in the U.S. is currently 0.06%, according to the FDIC. But online-only accounts eliminate the costs of running brick-and-mortar branches, which allows banks to offer better rates. Goldman Sachs announced last week that it completed the acquisition of GE Capital Bank. The purchase came with an online deposit platform that had around $16 billion in deposits. "This transaction increases the funding diversification and strengthens the liquidity profile of Goldman Sachs and GS Bank," said Robin Vince, Treasurer of The Goldman Sachs Group (GS), in a press release last week. Goldman reported earnings last week that showed revenue fell 40% in the first quarter.